High School seniors from Kansas and Oklahoma took part in Cowley College’s Fall Senior Day held Wednesday, November 4 on the school’s main campus in Arkansas City. A total of 224 students took part in the event. Students were given an opportunity to tour the campus, learn about scholarships and financial aid, while information was available from different organizations/areas including all the club/activity sponsors, academic departments, athletic coaches and student life staff. There was also a student and parent panel and prizes given away at the end of the event. Great Western Dining provided lunch for the students and their parents in the Brown Center’s Earle N. Wright Community Room. 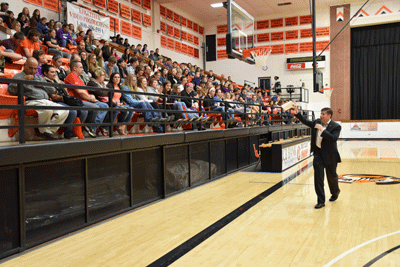 Cowley College admissions director Marcus Hicks was excited with the outcome of Senior Day. “My staff did a great job promoting the event at college fairs, high school visits, and calling on the phone,” Hicks said.